Projects in Virtuous are often analogous to "funds" in other CRM systems. These are projects, programs, or initiatives which are part of your organization's mission, and which your givers are funding. At the most basic level, any program for which a giver could make a restricted gift should be a Project. Projects can be arranged in a hierarchy, with top-level, or parent, Projects and then related SubProjects. Multiple Projects and SubProjects may also be grouped together by either Type or Location, providing reporting flexibility. First off, that sounds like some great work! Your nonprofit is awesome. Now let's set up these Projects in Virtuous. First, we'll want to configure your Project Settings. 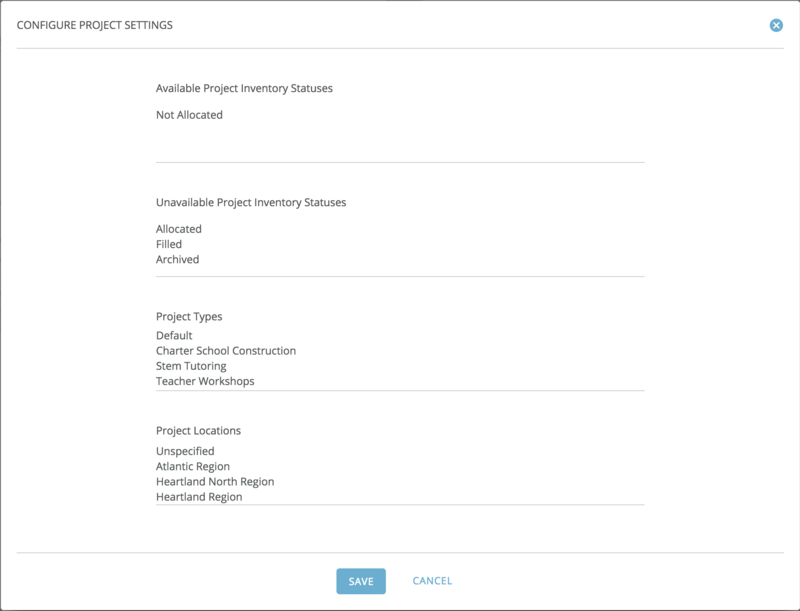 Navigate to the Settings menu, click “Data Customization”, then “Manage Project Settings”. Here, you'll have the ability to set organization-specific list values for certain Project fields. Inventory Status: For some nonprofits this may not apply. The Inventory Status field is particularly used by sponsorship organizations, or any time projects are designed to be funded only by a single giver. In these instances it's necessary to track which Projects are sponsored and which are available to be sponsored. On the Project Settings page, you'll have the option to create separate lists of "Available Statuses" and "Unavailable Statuses." These values will all be combined into the single "Inventory Status" drop-down on the Project Edit screen. Values in the first group will all denote some type of availability, while those in the second group indicate a project is unavailable for sponsorship. Types: Project Types provide a way to combine multiple Projects and SubProjects under one umbrella, typically for reporting purposes. If you're not certain whether something should be a Type or a SubProject, consider whether you are dealing with an initiative that is common to multiple areas of focus for your organization, or unique to a specific area or Project. Common initiatives make sense as Types since they can include multiple Projects and SubProjects. Locations: Since these are user-defined, Locations may be states, cities, regions, countries, even continents - whichever makes the most sense for your organizational setup. OK, our Project Settings look good. It's time to start creating our Projects. Navigate to the Projects and Designations screen from the main menu. There, click on the blue add button in the upper right to bring up the new Project form. Project Code: This code may be the GL code for the Project in your accounting software, or and internal code used to identify a particular Project. This Project Code can be used during gift entry to identify the Project designation for a gift. Project codes must be unique - even if a Project or SubProject is Inactive, it's code cannot be re-used. We've already covered the Project Designation Type, Current Status in Inventory, and Location fields. Per our example, we will set up each city as a Project, which would look like this. After clicking Save, we'll be taken to the Project screen. You may click the edit icon next to the Project Name or anywhere else on the screen to edit the Project information. Click on the SubProjects tab to create new SubProjects, or view them for existing Projects. Click on the blue add button in the upper right to bring up a form similar to the new Project form and fill in the information for your new SubProject. Click SAVE and you'll be taken to the SubProject page. On the left side of the blue page header, you'll see the Parent Project name. Click the name to be taken back to the Parent Project page and then enter any remaining SubProjects. The Media tab for Projects provides a space to store or link to image files related to your Project. These may include photos of construction progress or individuals helped by your program, which can be used in progress updates to givers. Progress updates are a great way to say thank you and keep your givers engaged. The Impact tab is divided into two sections. 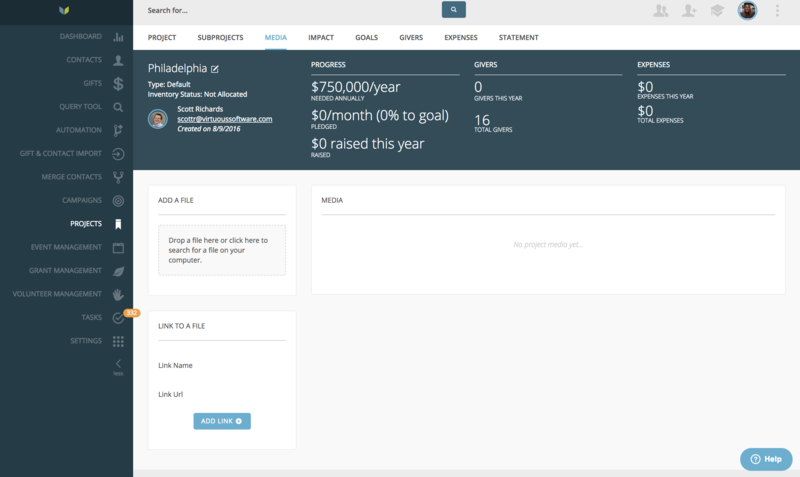 In the top half of the screen, you can set Goals for your Project. Goals are distinct from SubProjects in that they represent Project milestones that have internal significance for you and your team, but are not initiatives that a giver may give to exclusively. For example, to build one of our hypothetical charter schools, we may know that our total Project budget includes a number of smaller costs. We can use Goals to track these costs and see when we have received enough money to check them off our list. To add a Goal, click on the blue add button in the upper right of the Goals box. One the new Goal form, you'll have the option to create one of two kinds of Goals: Numeric or Descriptive. Numeric Goals have a stated count of objects or milestones to be met. Examples might include "Dig 25 new wells" or "provide 50 meals for the homeless." For our charter school, one of the goals may be "Purchase 300 new student desks." Descriptive goals are more esoteric, like "Improve the lives of inner-city students" or "World Peace." To be measurable, these goals must still have a monetary cost to achieve them. For example, a descriptive goal for our Philadelphia Teachers' Workshops might simply be "Empowering Teachers." As gifts are received and credited to a project, the Goal progress will be automatically updated. For these last two options, a search box will appear to connect the update with a specific giver. Below the Type drop-down, you'll see a search field that allows an update to be tied to a specific Project Goal. Just start typing to search for a specific Goal. And finally you'll see a space to attach PDFs or other files. Especially for sponsorship organizations, you may have physical notes to attach to giver updates. The Givers tab lists all of the gifts and pledges that have been credited to your Project. The Statement tab allows users to view and even print a detailed statement of all gifts and expenses logged within a given month or other specified timeframe. This is especially useful for missionary organizations and other nonprofits where field staff may be raising their own support. Once you've created your Projects and SubProjects, you'll be ready to start tracking progress on your fundraising initiatives.